Our state’s flagship educational institution, the University of Arkansas at Fayetteville, is constantly devising new ways to market its student initiatives and events. For years now, Magna IV has partnered with the U of A to produce high-quality printed collateral for its academic departments, athletic programs and recruitment efforts. So when the university decided to open a Sam M. Walton College of Business satellite facility, it was a no brainer to turn to its trusted partner Magna IV for help with interior graphics. 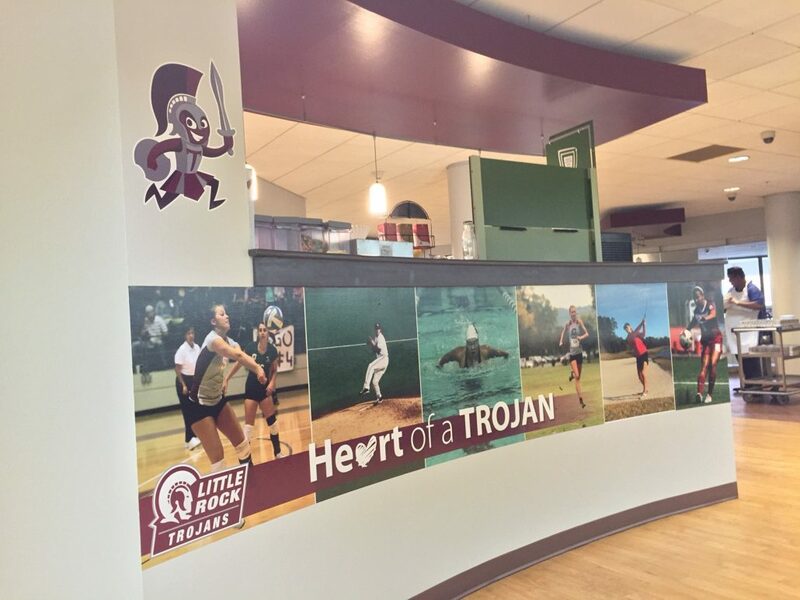 The university was initially stumped about what to do with its new space on Main Street in downtown Little Rock and its oversized interior glass wall. It knew it wanted some type of window cling to give the building an enhanced visual appeal. However, it also needed a product that would allow students and passersby to see into the space from the street, both day and night. The Magna IV team immediately went to work, overseeing the project from start to finish. 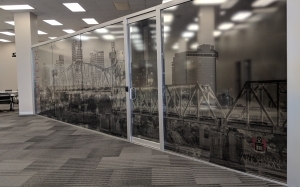 It used its wide-format printing equipment to create a transparent vinyl window graphic 50-feet-wide by 10-feet-tall image of the downtown Little Rock skyline. It printed the image on clear vinyl, a cost-effective and durable material, to help prevent wear-and-tear and damage from cleanings. Its in-house experts then cut and placed the window cling to ensure a seamless installation. Once complete, the U of A was able to settle into its new space and focus on its mission at hand—attracting and educating the next generation of our state’s business leaders. Does your business or organization need help creating interior design graphics such as window clings, wall wraps or floor graphics? Read our success stories using the latest printing technology. Contact Magna IV at 800-946-2462 today! Retail graphics elevate the look of a merchandising display and also set the tone of your store. Retail displays showcase products and let customers know what to expect when shopping at a business. Displays at retail stores should not be thrown together at the last minute. Making proper use of the available space can help you group products and create a theme that retail printing services can enhance in the minds of consumers. Too many patterns and clashing colors distract customers because they don’t have a focal point that guides the eyes to certain products. Create a visual presentation that clearly delivers the point you want to make about a product or a promotion. Once the sale or promotion has ended, update your retail graphics to keep customers engaged and interested in your newest spotlighted product. Effective retail graphics contain promotional, directional or informational copy that gives customers the details they desire. Providing visual cues is a way to guide consumers through the store in a strategic manner while providing vital information about products and services at a glance. Group your products in a logical manner when creating retail displays. Placing products together grabs the attention of customers while also telling a visual story of how the products fit together. Don’t be too “matchy-matchy” with the items because including an object that seems a bit different from the others can make customers stop and take a closer look at the display. Hang vinyl banners outside the store to advertise seasonal sales or events, Use bright colors to catch the eye of customers and a solid colored background to make your product message stand out. Retail graphics are a crucial component in influencing the final buying decision made by customers. Experience matters when it comes to retail printing services and Magna IV has been providing high-quality print products and solutions for more than 40 years. We use the latest print technology to create retail graphics that get the attention of customers. The design and creation of retail displays has evolved greatly over the past four decades and our experienced team has been at the forefront of these changes. We design and create engaging visual merchandising graphics that encourage customer interaction and influence the final buying decision. Learn more about the connection between retail graphics and visual merchandising by contacting our team today. Salespeople are seen as the front line of sales in a retail business. 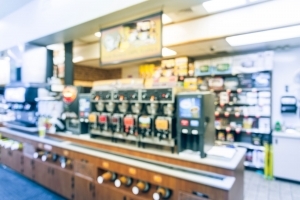 While they are an important part of informing customers about the products and services offered, convenience store graphics actually greet customers first and can be seen as a silent salesperson. C-store graphics grab the attention of customers and create interest in the products available for purchase. Once the consumer enters the store, floor graphics continue to influence customer buying decisions by leading a person directly to the products or specials businesses want to spotlight in the store. Even though the graphics are directing customers to certain products or sections of the store, the consumers do not feel pressured to make a purchase by an actual salesperson since they are subtly being influenced by custom made graphics and/or a POP display. As customers walk through the store, take advantage of this marketing opportunity to increase sales. The cost of producing floor graphics to promote a product or company is much smaller in comparison to a traditional billboard. Convenience store graphics that are placed on the floor have the flexibility to be an inexpensive short-term signage solution as well as durable enough to be a long-lasting branding tool. Floor graphics are noticed by customers because they are paying attention to where they are walking in addition to naturally looking down to view what is on the floor in front of them. Making customers focus their attention downward to the floor narrows their attention to the C-store graphics at their feet. This allows the content to have more of an impact and influence the buying decision of consumers. Put convenience store graphics, AKA “the silent salesperson”, to work for your C-store by contacting our design team today. Large format printing is a term that describes print materials that are too large to easily be printed on readily available sizes of printing presses. Wide format printing is a critical part of any branding strategy since it covers a wide range of print materials such as windows, posters, store displays, banners and event signage. These materials can be used to get attention, promote events and provide a visual reference for customers to easily recognize when branding a business. The first step in building brand awareness is being noticed by others and making them want to learn more about your services. This can easily be accomplished thanks to the size and variety of materials created by large printing services. High-quality images market your business – Images play a large part in brand awareness because they stand out among a mountain of text. Large format printing creates memorable images instead of text that might be hard to process and remember in the limited amount of time that a person is viewing an ad. 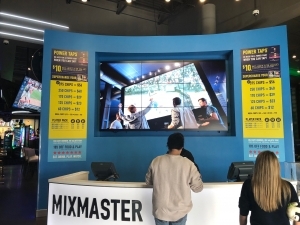 Market new product launches – Wide format printing creates materials such as signs, banners and store displays that spread the word about the launch of a new product in the marketplace. While the digital age of marketing allows for a wide viewership of an ad, a physical flyer or brochure still commands attention and makes people stop to take a look at the printed material. Print on almost any material – From PVC to fabric to paper and vinyl, wide format printers can print on almost any material. Large format printing services stand out from other branding efforts because of their size as well as the variety of materials available for use in wide format printing. You can have the greatest product in the world or the best idea for a business. However, you still need to effectively market your business in order to build your brand in the eyes of customers. Large format printing allows you to get noticed and be remembered by others that are intrigued by your printed materials and want to learn more about the products and services offered by your business. Learn more about the branding benefits offered by large format printing by contacting us today. Retail store graphics are an essential part of the marketing efforts that drive sales for retail and convenience stores. Retail graphics and signs help shoppers to better understand the personality of a business and also helps to lead them in making purchases based on the information provided by the signs created by retail printing services. The signs that are displayed in retails stores can drive sales at that particular point in time or they can promote sales and specials that will occur in the near future. There are multiple retail signs that deliver increased sales and the section below shows you how these retail graphics deliver the results you desire. Point of purchase signs (POP) – This category of retail graphics can include anything from floor graphics that lead the way to certain products, cardboard cutouts that can be placed over merchandise and pop-up banners that show customers where to find certain items. POP signs spotlight promotional items, seasonal merchandise and special deals on certain items. 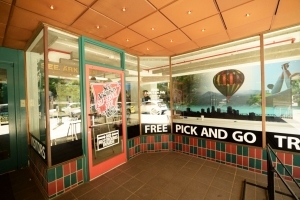 Door and window graphics – These graphics are the first thing a customer sees when he or she enters the door of a business. Use this prime opportunity to market current sales and events and to promote special sale hours or display enticing sales copy or keywords. Branded ceiling tiles – These custom made tiles can display your logo or the images that brand your product. Colorful and enticing graphics will have customers looking up and receiving your branding message. 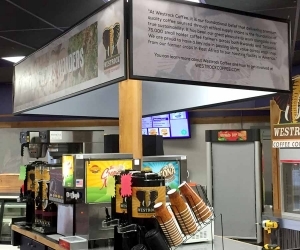 Eye catching graphics and signs drive sales in both retail and convenience stores. Professional retail printing services create retail store graphics that attract attention and alert customers to the specials, deals and events stores want to promote to the buying public. Custom made retail graphics tell a story and give the public a better idea of what the store is all about and the services they want to deliver to customers. Retail printing services include the conception of the graphics as well as their creation and installation. 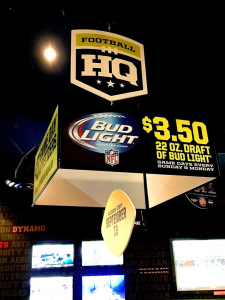 All of these elements combine to make graphics and signs that stand out in the marketplace. Contact us today to learn more about using retail store graphics to drive sales and attract customers to your business. The reasons listed above combine to create a successful and well-received fulfillment experience for both you and your customers. Seasonal and Sales Fluctuation Flexibility – Sales can rise during certain seasonal events. 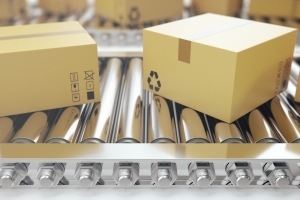 Handling your own fulfillment means you need to hire extra workers for the added demand. We eliminate the need for extra workers by managing the surge in sales. All you need to worry about is providing the product that is ordered. Lower shipping costs – You can offer customers a lower shipping cost thanks to our regional/national/international shipping program as well as the bulk delivery discounts we get thanks to the size of our shipments. Eliminate fixed costs – The cost of storing inventory rises while your sales are flat or declining. However, you still pay the same amount for rent on a warehouse. Partnering with us cuts your fixed costs since you won’t be paying for a warehouse space. Magna IV uses the latest technology to execute our print fulfillment services. Our state-of-the-art fulfillment and distribution services include custom management and information software that can be fully integrated with your print and fulfillment needs. Plus, real-time reporting allows you to know exactly when your product ships and reaches its destination via our mail tracking system. We are always researching new techniques for print fulfillment and this means finding new shipping methods that allow us to save you money while still delivering your product on time. Brand your business to customers by contacting us today to learn more about our print fulfillment and distribution services. Cross media marketing is when multiple media forms are used to promote a marketing message to an audience. For example, your business can take advantage of a direct mail campaign that drives customers to a customized PURL (personalized URL) with a landing page created specifically for each recipient of the direct mail campaign. In addition to the PURL, you will get a coordinating email that contains a web link as well as dashboard reporting. Plus, you can even utilize text messaging if you desire. Drive brand consistency – Cross media marketing allow you to use multiple media platforms such as marketing printing services, email marketing and a customized URL at the same time. Creating a cohesive presence among multiple marketing channels builds brand consistency in the eyes of consumers. Effective delivery of your message to customers – The goal of any marketing strategy is to find engaging ways to communicate the value of your product or service. Cross media marketing makes it easy to deliver your message across specific channels that make sense for your customers. 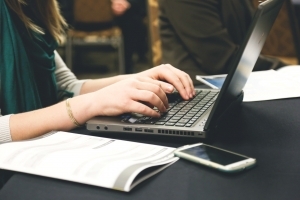 Once you determine the proper marketing channels, branding elements such as targeted emails, printed content, text messages and personalized URLs can be used to reach your target audience. Marketing printing services are a proven way to reach a mass audience, The experienced design and production staff at Magna IV use the latest technology to create a printed piece that can easily be translated to an online presentation, at a personalized URL, while providing consistent branding across multiple marketing platforms. The future of marketing is here today and it is known as multi-channel marketing, Reach a larger audience with cross media marketing that targets your audience without being so spread out that your brand identity gets lost in the delivery of your marketing message. Contact us for more information about saving money while expanding your advertising reach with cross media marketing. All businesses hope for brand recognition with customers. 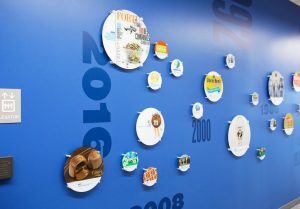 They strive to have others recognize their work and their company through such interior graphic design visual elements such as a logo, signage or even some of the marketing collateral that is part of the environmental graphics of a business. The commercial interior design of a building can also serve a brand recognition purpose as customers have the ability to walk in and find themselves in an immersive brand experience thanks to the environmental graphics. Branding refers to the image customers have of a company and also the emotional response they get when they view the products, services and materials associated with the company. Residential graphics focus on living spaces in a house, apartment or condominium. The graphics can be specialized for a particular section of the home such as the bathroom, kitchen or home office. Some common types of residential interior design graphics include green or sustainable graphics, elder design which makes the graphics easier to understand for the elderly or disabled and graphics related to certain areas of the home such as home theater areas, workout rooms and home offices. Commercial interior design graphics can cover a wide range of businesses including retail stores, restaurants, hotels and offices. The type of graphics used depends on the needs of the business. Retail spaces and restaurants often have certain marketing needs including colors that brand them with a franchise or bright product displays. Hotels and offices often have a more subdued color scheme and require graphics that work to project a professional appearance. 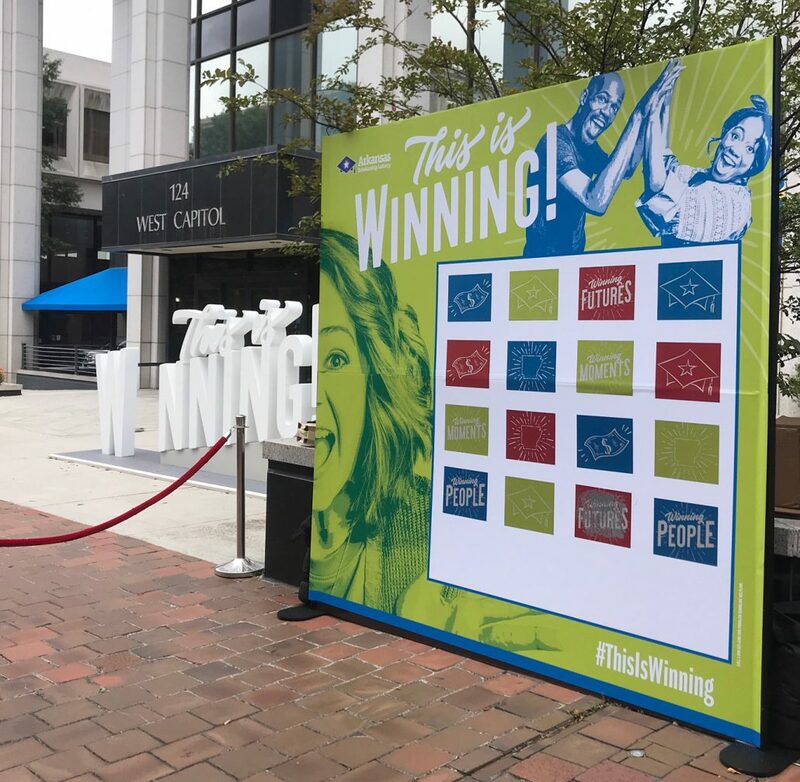 Experiential and environmental graphics allow businesses to communicate and connect with customers on a level that takes all of the elements of a design into account. The combination of imagery, color, text and the technology behind the graphics combine to create an environment that communicates the identity of the business as well as the emotion that drives consumer reaction to the company. These graphics specialize in telling a story without coming across as being “sales like” and deliver the branding message in a manner that is more subtle than traditional advertising methods. Take advantage of the branding benefits offered by interior graphic design by contacting our experienced design team today. It is obvious to say that, if you are organizing and executing an event, you want people to show up for the event. One of the first steps you can take to win big is having event signage professionally made to promote the event to the public. Event banners and signs can be designed and manufactured in various shapes and sizes so they can easily be placed indoors and outdoors. One of the best materials for making banners for special events is vinyl. Vinyl banners are made of quality materials that remain durable in any kind of weather. Event signage helps you to brand your event, attract customers and create word of mouth for the event. Interested in having event banners and signs created? Keep these helpful tips in mind! Make sure the banners and signs are aesthetically pleasing. The design needs to be attractive to the public. This means attention must be paid to every detail on the sign from the colors to the images, font and logo. The banner should be specific to the event. Don’t waste valuable sign space to include information not related to the event. Make sure the banner relates to the theme of the event in order to attract your audience of choice. The people that are interested in the event want information connected to the event being promoted. Don’t overload the audience with too much information. Overcrowding with too much information can make people turn away from the banner. Too much text and images can be very distracting to the audience. Magna IV specializes in event signage solutions for events of any size that are organized and executed by companies in any business sector. Our expert team discusses your vision for the design of the banner as well as the information you want to include on the sign. Once the design of the event banners and signs is approved, our experienced team manufactures them to your specifications. We also professionally install them to ensure they are visible to the public and that they will remain secure in any type of weather. 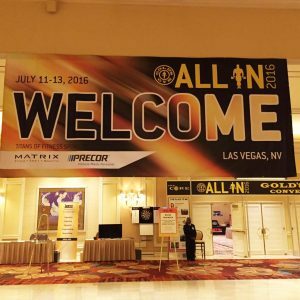 Put event banners and signs to work for you by contacting our experienced design and installation team today. No matter what type of business you own, one of the keys to success is getting the attention of customers. Banners and signs are a vital part of any branding strategy to grow and market a business. Some businesses take a thoughtful approach to designing banner signs while others think their signage solutions require nothing more than putting their name on a banner. While having your name out in public is certainly one way to alert customers to your existence, there are other elements that need to be included in a sign. To help you get the maximum impact from using banners and signs, we’ve listed five critical mistakes you might be making with your signage. Contact info – Your name on the banner does not help if you don’t tell people how to contact you. Contact info can include your address, phone number and website. Spelling and grammar – The presence of spelling and grammar mistakes can make customers view your company as unprofessional. Proofread everything on your signs before they are printed. Too crowded – Many signs are viewed by customers driving in their car with a short amount of time to read your sign. Info on a crowded sign isn’t processed and remembered by drivers. Aesthetically pleasing – Signs with clashing colors and bad art are not pleasing to the eye and should be avoided. Social media – Many customers look for more information on social media. Your sign should remind them to find you on Yelp, Facebook or other platforms. A professionally designed and eye-catching banner is a crucial aspect of branding your business. The first step in creating banners and signs is scheduling a consultation appointment with the experienced design team at Magna IV. We will discuss your goals and work with you to make your signage solutions come to life. We will ensure your banner signs avoid the mistakes listed above and market your business in a way that is easily, and instantly, understood by consumers. Professional signage solutions are our specialty so trust our team with your professional banner signs. Contact us today to avoid critical mistakes when designing your banners and signs.